Young people generally do not run from places where they are loved and know unconditional acceptance. They do not run away from homes where there are solid relationships. They do not run from homes in which the family is planning activities and doing exciting things. You can accomplish nothing of lasting value simply by being an authority. You must seek to counsel and influence. Encourage your children not to run from their questions. Everyone does not have to have every question, but everyone must find resolution for the questions he has. Christian faith is robust enough to stand close scrutiny. Overall, as I finish up the book, I am reminded that as the children grow older, my relationship with them counts more than the rules I make. I must work to influence them during the teen years, not simply command them. I can set all the rules I want, but what good do those do when the child leaves home (or can circumvent any rule I come up with while still in the home)? He or she needs to be able to think for themselves, and it is my role to guide them in that process. 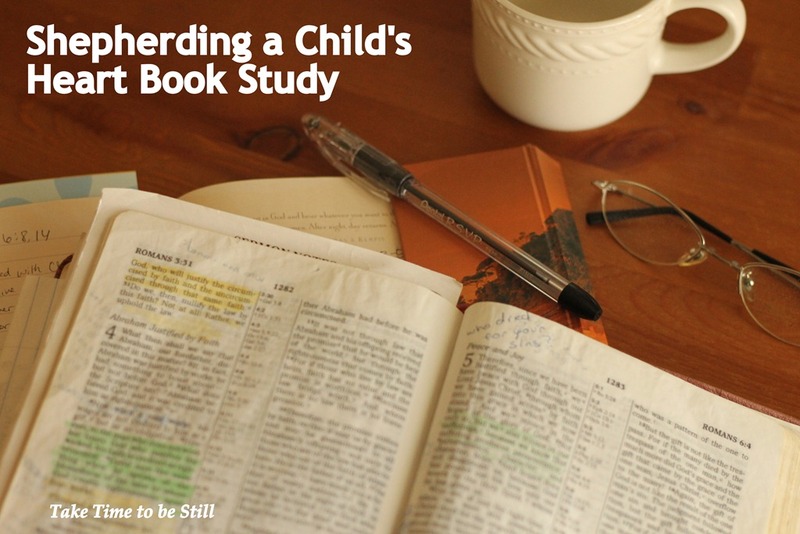 This is the last week of our Shepherding a Child’s Heart book study! Today we are covering chapters 16 and 17, which covers training objective and procedures in the childhood (ages 5-12) years. The big issue during these middle years is character. Your child’s character must be developed in several areas. You want your child to learn dependability, honesty, kindness, consideration, helpfulness, diligence, loyalty, humility, self-control, moral purity, and a host of other character qualities. This requires addressing more than simply disobedience or disrespectful attitudes towards the parents. Making new rules to govern every single issue doesn’t work if the child’s character is neglected. To develop the character, the parent must first assess the needs of the children by looking at the child in relationship to God, to himself, and to others. This quote struck me as a really good visual for the overall premise of this book. The heart is central to behavior. I think this idea is most useful in the childhood years when the child’s conscience and sense of right and wrong really begins to develop. A good reminder for me as my oldest son is entering this stage. We are almost to the end of our Shepherding a Child’s Heart book study. Today’s chapter goes into more detail on the idea of spanking. In the opening of the chapter, Tripp pointed out that he and his wife used to notice “cyclical patterns of behavior” with their children, where “every few months, they would become unruly,” so the Tripp’s would get serious about being precise and consistent, returning to the “basics – speaking once and expecting obedience.” As things returned to normal, eventually the pattern would repeat itself. Then one day, they realized they were the ones producing the cycles! “When things went well, we became lax. Eventually, the deterioration in our children’s behavior would become painfully obvious. We would respond with renewed courage and effort.” Before getting into any of the rest of the chapter, I have to admit that this passage hit me over the head! I have seen this exact thing in my two boys. As soon as I think my boys have something down, a week or two later the issue will start cropping up again! And I realized that this is sometimes because I let things slide when they are “mostly” obeying. I was convicted of my need to be more consistent in how I deal with disobedience. This can be hard because it takes effort and mental stamina that can sometimes be difficult to muster. But if I keep the end goal in mind, then I will be more likely to persevere. Tripp then addresses some of the frequently asked questions. This is where I again disagreed with him a bit. For example he says “Rebellion can be something as simple as a small child struggling against a diaper change or stiffening his body when you want him to sit on your lap….You have no way of knowing how much a child less than a year old can understand, but we do know that understanding comes long before the ability to articulate.” The problem is that earlier Tripp says that a parent must “Secure an acknowledgement from the child of what he has done.” This obviously can’t be done with a very young child and I would be very careful of seeing something like struggling against a diaper change as true “rebellion” at less than a year old. As we move into Part 2 of the Shepherding a Child’s Heart Book Study, Tripp goes into detail about how the objectives and methods of Part 1 work within an actual family. Again, I had some disagreements with the author, but I still found some valuable reminders in the chapter. The parent must be honorable in his conduct and demeanor….A parent who is respectful to his children and teaches them with dignity and respect will be respected by his children. You may not yell at your children. You do not make them your slaves. Suffering indignities from you cannot be a part of submission to authority. When you fail to be respectful or courteous, or sin against them, you must seek forgiveness. This reminds me of the saying “more is caught than is taught.” We can tell our children to be respectful and submissive, but if we don’t model it, we will simply be teaching them to be hypocrites like us. I must admit that I am guilty of tending to say “no” out of habit, without really thinking things through. I want to show my children grace, not just “the law,” so I need to work on implementing this idea of saying “yes” to appeals and requests unless there is a good reason to say no. Even though the child will not be able to fully appreciate the importance of submission, training him to do what he ought, regardless of how he feels, prepares him to be a person who lives by principle rather than mood or impulse. This is certainly something I want to train my children to do – not to be swayed by friends or emotions, but to do what’s right regardless of influences. As I said, I didn’t agree with everything Tripp said. One problem I think Tripp should have addressed was that he mentions the verse in Ephesians 6 that tells children to obey and honor their parents that it may go well with them and they may enjoy long life on the earth. Tripp then says that if children stay inside the circle of honoring and obeying, “within that circle things will go well and they will enjoy long lives.” Except that’s not always true. Anyone who has ever lost a child knows this. The Bible doesn’t teach that there is a circle of safety and that you are guaranteed a long life and everything will go well if you just honor and obey your parents. Nor does the Bible necessarily teach that those who don’t honor and obey will necessarily have a poor life and die young, though this, of course, can happen. In the early years of a church, honoring and obeying your parents (in a time when Roman persecution of Christians was at its height) in many cases actually guaranteed an early death as a martyr. I think, and feel free to correct me if I am wrong, but it seems like this promise is a general one, not a specific one – i.e. in general principle, if you learn to obey and honor your parents, life usually goes better than if you rebel, and your rebellion could lead to an early death by poor choices (think of the rebellious teens and young adults who die every day from drug overdoses, drunk driving, gang violence, etc.). But this promise is not a specific cause and effect principle for every person. The command to honor and obey is for everyone, but the specific consequences for doing or not doing this are more general rather than specific to every single individual. Chapter 11 of the Shepherding a Child’s Heart Book Study is where things begin to get a bit controversial. It is in this chapter that Tripp covers the use of the “rod” in discipline, AKA spanking. The use of the rod signifies a faithful parent recognizing his child’s dangerous state and employing a God-given remedy The issue is not a parental insistence on being obeyed. The issue is the child’s need to be rescued from death – the death that results from rebellion left unchallenged in the heart. The rod of correction brings wisdom to the child. It provides and immediate tactile demonstration of the foolishness of rebellion. Properly administered discipline humbles the heart of a child, making him subject to parental instruction. My own personal take on this chapter is that while I do believe spanking has its uses (I won’t go into them right now), I disagree with Tripp’s use of the terms spanking (“the rod”) and discipline interchangeably. Spanking may be a form of discipline, but it is not the only form. He even quotes a verse in Hebrews 12 about how “the Lord disciplines those he loves” to support his use of the rod along with communication as mentioned in chapters 9 and 10. However, I personally have never seen the Lord literally use a literal rod to discipline his children (have you?). So the discipline in this verse must refer to other forms of discipline than physical spanking with the rod. At least thus far in the book, I do not see Tripp discussing many of these other methods that you can see in Scripture. I did appreciate, however, Tripp’s continued reminder that spanking should never be administered out of anger, retribution, or frustration, but out of a place of love. Chapters 9 and 10 in the Shepherding a Child’s Heart Book Study cover the Biblical Communication Method of Communication. This type of communication takes effort, time and prayer, but it can make a huge difference in your relationship with your children. I know this is something I am not always good at, but I am striving to improve my communication with my kids, especially when disciplining them. This week in the Shepherding a Child’s Heart Book Study, we will be covering chapter 8 today, chapters 9 and 10 on Wednesday and chapter 11 on Friday. As I mentioned last week, I have read some of these chapters with a bit skeptically. I think Tripp has a lot of really good points, but he tends to be very black-and-white about some of his assertions, and I don’t necessarily agree with everything he says. Scripture should be our ultimate guide, and anything we read in a parenting book or any where else (from a friend, pastor, a blog, a seminar, etc.) should be judged in light of what the Bible says. That goes for what you read on this blog as well! That being said, I will summarize the good points that I learned from the book, and evaluate the rest at the end of the study. In chapter 8, Tripp begins discussing what he calls the Biblical method of communication. He says communication is “not only the ability to talk, but also the ability to listen…. Your objective in communication must be to understand your child, not simply have your child understand you,” and to “help [your] children articulate their thoughts and feelings,” and “engage your children to understand what is going on inside.” This is part of what we talked about previously of understanding what is going on in the child’s heart, getting at the root of the behavior. For example, if my two year old disobeys me and turns on his light before it’s time to wake up, the root of his behavior is selfishness. He is thinking only of himself and his desire to wake up, not thinking of his brother who is still trying to sleep (in the same room) at 5 a.m.
Tripp gives examples of questions to help you “draw out what your child is thinking or feeling” and he encourages you to come up with your own. I found this fairly helpful in reminding myself to look at the heart and the root of the behavior, not just reacting to the behavior itself. This week, chapters 5 and 6 of the Shepherding a Child’s Heart Book Study are going to be discussed together. I was glad that these two chapters were combined, because I must admit that I read chapter 5 with a raised eyebrow. However, chapter 6 explained Tripp’s point a bit better. Just reading Chapter 5, you might, as I did, question if all of these are bad goals. Isn’t having a child come to salvation one of the greatest goals of parenting? Shouldn’t we be teaching our children to worship? Tripp, however, says that “Man’s chief end is to glorify God and to enjoy him forever…. From their earliest days, they must be taught that they are creature made in the image of God – made for God. They must learn that they will only ‘find themselves’ as they find him.” In other words, we must not focus on the goals above for their own sake. In Chapter 6 Tripp talks about reworking your goals “in light of the chief end of man – to glorify God and enjoy him forever.” Tripp explains how simply developing special skills as a goal in itself can lead to pride or self-trust. While having a biblical worldview about such activities “dictates that you should teach your children to exercise and care for their bodies as an expression of stewardship for God’s gifts. Abilities should be developed because God has given the stewardship of talents and special capacities.” It can also be a “valuable way of providing family unity and oneness.” Having a goal of saved children makes the mistake of looking for “the major spiritual event of salvation [praying the sinner’s prayer] and misses the spiritual process of nurturing your children.” Family worship, too, is “a means, not an end. It is a means to the end of knowing God.” Manners must be seen as “an expression and application of the duty of loving my neighbor as myself” rather than “an elaborate means of pleasant social manipulation.” As you can see, the goals above can still be valuable activities, they just can’t be goals in themselves – the ultimate goal must be glorifying God and enjoying him forever. Teaching your children to live for the glory of God must be your overarching objective. You must teach your children that for them, as for all mankind, life is found in knowing and serving the true and living God. The only worthy goal for life is to glorify God and enjoy him forever. As God’s agents, we need to be sure we have clear goals in mind for correction, discipline and training. Chapters 5 and 6, which we will cover on Wednesday, discuss some of those goals.